Titian’s Allegory of Prudence in London’s National Gallery is one of the more enigmatic paintings of the Venetian Renaissance. Many people have probably never noticed that it is contained within a French Baroque frame that not only is the wrong style, but casts odd shadows on the painting. The museum has opened a call on Just Giving, a charity fundraising platform that has no deadline and low fees. 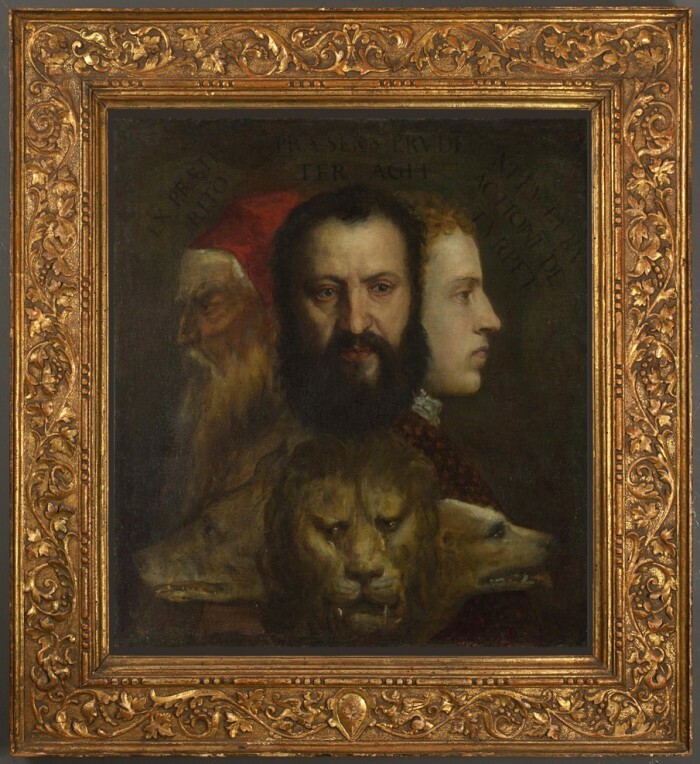 They seek 17,000£ to purchase a contemporary frame for Titian’s work. Lynn Roberts, an expert (and blogger) on frames, tells us more. We’re used, these days, to museums and other institutions launching appeals to the public to help with the purchase of a painting or object which has come onto the market. These appeals frequently run into millions of pounds, and often help to secure items which have been sold from an historic house or collection to finance conservation work. But this current quest for money is different: an unusual, idiosyncratic appeal by the National Gallery, London, to help it buy a superb frame for a painting by Titian and his workshop. 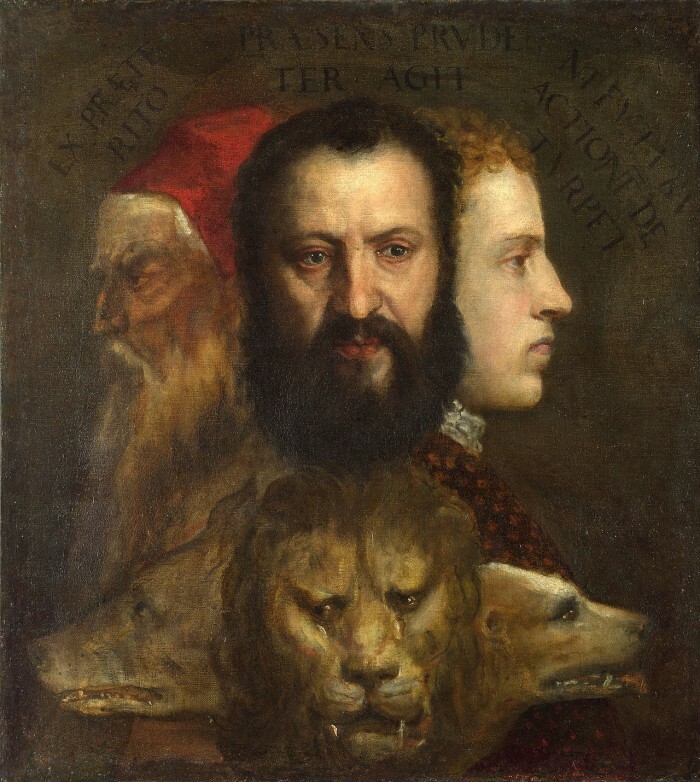 Titian’s Allegory of Prudence is a mysterious painting: ambiguous and complex, open to interpretation in various ways. 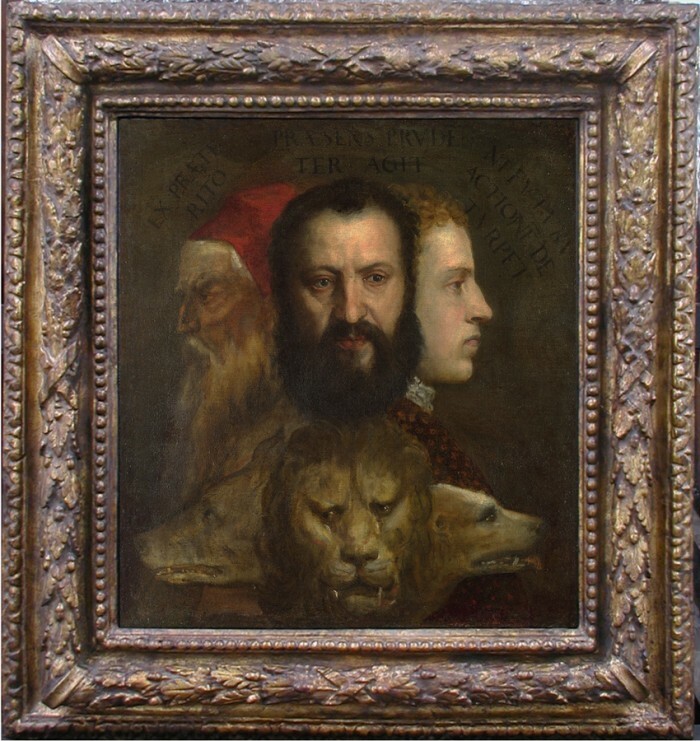 It consists of three male heads, an old and a young man shown in profile on either side of a mature man, painted full face; these are placed above three animal heads – a wolf, a lion and a dog. The painting technique and ability vary over the canvas, but experts agree that the striking and powerfully modelled central head is by Titian himself. 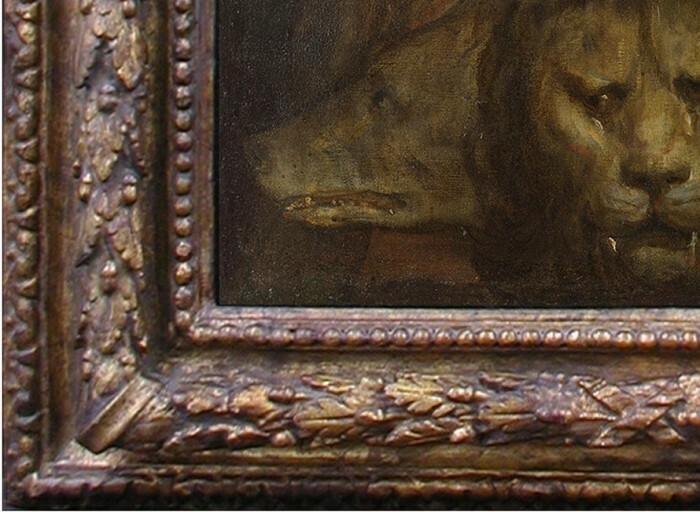 The most common interpretation sees the painting as an allegory of the three ages of man, and the animals seem to express these: the cunning old wolf, the mature and kingly lion, and the agile young dog. Based on self-portraits of the artist in Berlin and the Prado, scholars also have suggested that the features of the old man are Titian’s own, while the central head may be his son, Orazio (or even Titian at a younger age), and the young man a cousin, Marco Vecellio. More mysterious is the Latin inscription curving above the three heads: ‘ex praeterito praesens prudenter agit ni futura actione deturpet’ – ‘out of [the lessons of] the past /the present acts prudently/lest it spoil the future by [rash] action’. The personification of Prudence is often shown as a figure with three heads; it has been suggested, therefore, either that the old Titian is regretting the sensuality of his youth and the arrogance of his maturity – wishing that he had been more prudent; or that this is a representation of three generations of artists, each learning prudently from the one before. The painting has belonged to the National Gallery since 1966 but has sadly been unable to exert its full mesmeric and intriguing power because of the way in which it’s been framed. It’s a Renaissance painting by a 16th century Venetian artist, but it’s not even in an Italian frame: the present setting is a Baroque French frame dating from the 17th century. 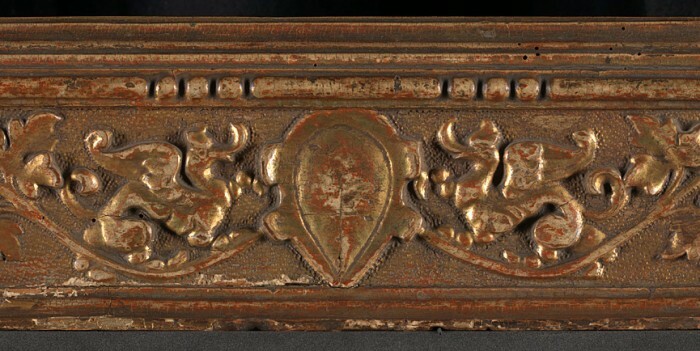 Picture frames during the Renaissance tended to have a fairly shallow profile (or cross-section); they might have raised convex or ogee (S-shaped) mouldings, or they could have moderate hollows; they might even have a garland of leaves, fruit and flowers, but this would be wide and shallow, topping a curve of supporting carved mouldings. Baroque frames are very different – they imitate Baroque architecture, in which the façades of buildings have areas set forward and back, curving deeply in and out, and producing dramatic shadows which give a theatrical touch to the elevation. This frame on the Titian has as its main ornament a carved garland of oak leaves and acorns that is so raised that it’s more than half round, and the hollows on either side appear very deeply etched. The strong shadows produced by this profile close in the composition of the painting, making it appear cramped and flat. The oak leaves have nothing to do with the painting, either decoratively or symbolically, and the gilded finish is now so obscured by dirt and discolouration that it might as well be painted brown. Now, the Head of Framing at the National Gallery has discovered a frame on the art market which might (almost literally) have been made for it. It’s even the right size – give or take a whisker. It is a 16th century Venetian frame, in a design known as a cassetta (‘little box’, because it’s oblong and flat in cross-section, and encloses the painting like a small case). Because of its form – a wide, shallow border of vine and acanthus leaves, like the embroidered edge of a tapestry – this frame opens out the composition of the picture, making it appear much more three-dimensional and sculptural, and helping to focus the spectator’s attention. The original gilding is in exceptionally good condition for its age: it reflects and supports the colouring of this extraordinary work, flooding it with warmth and light. It also provides a decorative area of transition between the mysterious world of the painting and the world of reality. Quite by chance (or not?! 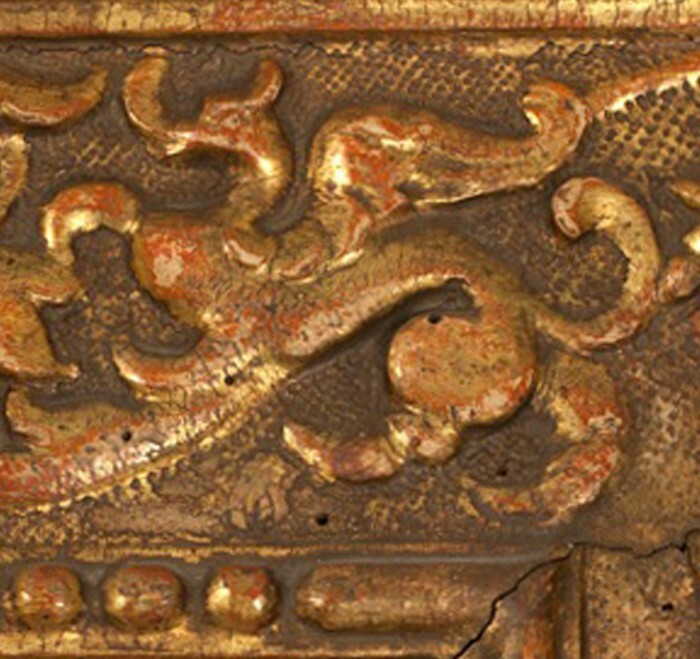 ), the frame reflects the symbolism of the painting. During the Renaissance, animals were often used as emblems for the seven deadly sins; the lion for pride, the wolf for avarice, and the dog for lust, etc., with these three often found together as the three major sins. In this allegorical language, the dragon is mors, or the death which will swallow up all sins: and – in the foliage which winds around the frame – tiny dragons are carved, growing out of the branches and transforming into leaves and pods. Studio of Raphael, a detail of the decoration in the Loggetta Bibbiena, 1516-17, Vatican. 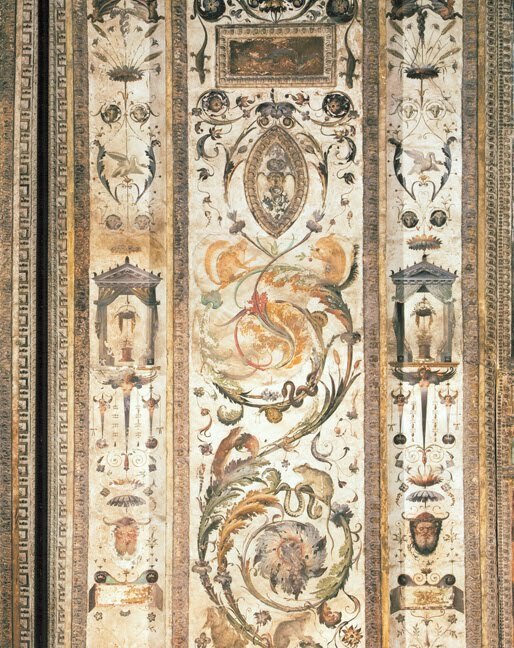 This type of ornament, with animals playing amongst delicate foliage and flowers, was influenced by the frescoes discovered in 1488 in the Golden House of the Emperor Nero in Rome and imitated by Raphael and others in the painted decoration of the Vatican. This frame is therefore perfect for the painting. Unfortunately, museums and galleries have very small budgets for reframing. There are so many things that come first – upkeep of the building, staff, heat and air-conditioning, conservation, education, insurance, exhibitions… frames come near the end of a very long list. 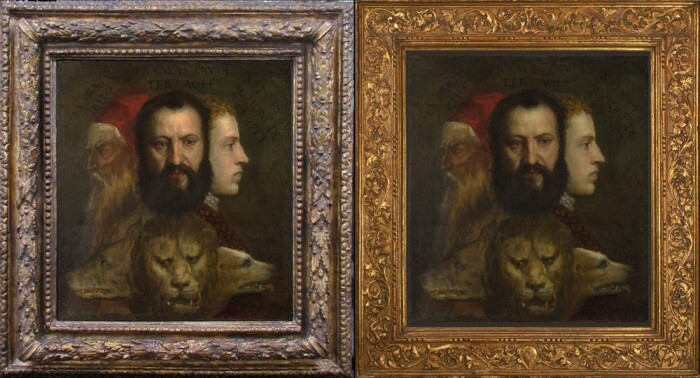 The new frame for Titian’s painting will cost £27,000, of which £10,000 has already been given by an anonymous donor. £17,000 is a tiny amount, compared with the millions another painting would cost; and in terms of the benefit to the Allegory of Prudence itself (and to the Renaissance gallery where it hangs), it would have a disproportionally huge effect. Take a look at the two side by side just one last time. Convinced that you want to see this frame on Titian’s Allegory at the National Gallery in London next time you visit? Make a difference by donating here. See also Lynn’s own blog about this and other frames.